Classic Japanese Kitakata paper is an ideal medium for archival and conservation projects. 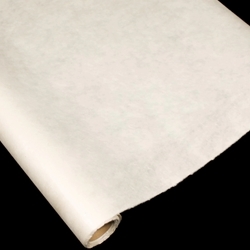 Machine-made from 100% Gampi, this traditional Japanese paper has a warm tone, smooth texture, and neutralized pH. Sometimes, buying buy the sheet just doesn’t cut it; so go BIG with the Classic Kitakata Roll. This authentic Japanese paper roll is ideal for large-scale and high-quantity projects such as mounting, printmaking, and conservation repairs. Made from the Japanese paper plant, Gampi, this quality paper is cooked in caustic soda to neutralize the pH and soften coarse fibers. Classic Kitakaka paper features a smooth and absorbent (unsized) surface with a warm tone, making it a classic paper for archival and conservation projects.